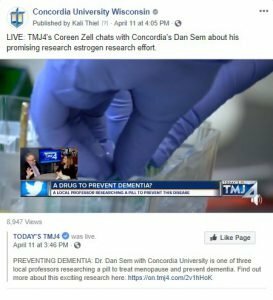 A Concordia-led estrogen research effort that's currently underway is gaining significant support and attention as of late thanks to a TMJ4 segment and recent campus visit from former Wisconsin Gov. Martin Schreiber. 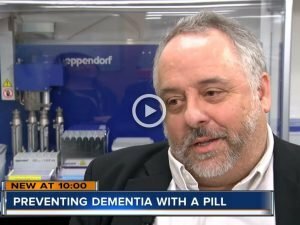 Batterman School of Business Dean Dr. Daniel Sem, along with Dr. Karyn Frick of the University of Wisconsin-Milwaukee and Dr. William Donaldson of Marquette University, have developed a “stripped-down” estrogen molecule that has proven effective in improving memory in a model system for treating dementia in post-menopausal women. Their research effort is supported by a National Institutes of Health grant, which was renewed for an additional three years this past fall. Women are three times more likely than men to develop memory loss and Alzheimer’s disease as they age, and those memory deficits are linked to a decline in estrogens, hormones whose levels plunge during menopause. The advantage of the new estrogen molecule is it doesn’t carry the increased risk of breast and other cancers as traditional hormone replacement therapy does. 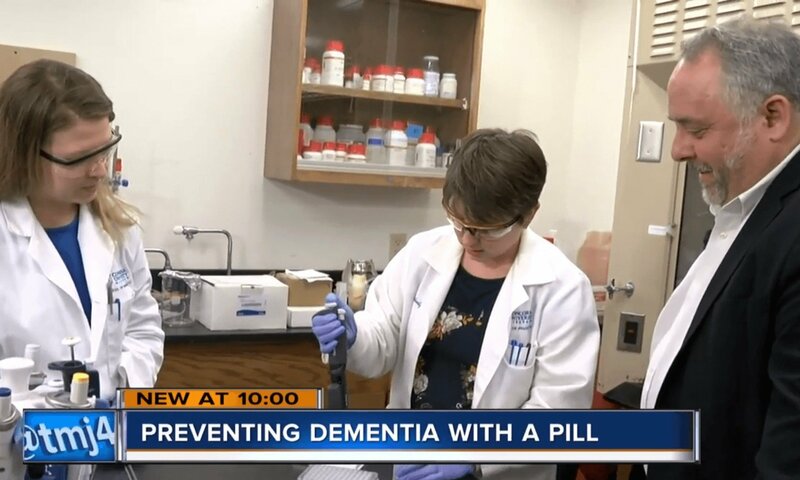 TMJ4’s Coreen Zell took an interest in the promising research effort underway. Click here or on the image below to view the segment. Click here or on the image below to see Coreen’s Facebook Live chat with Dr. Sem. 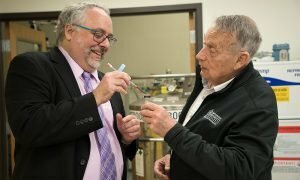 Last month, Sem also had the opportunity to demonstrate some of the research processes to Wisconsin’s former governor, who recently authored a book, “My Two Elaines,” which details his role as a caregiver to his wife, Elaine, who has Alzheimer’s. In addition to touring Sem’s lab, Schreiber spoke to pharmacy students in Dr. Travis Suss’ class about caregiver fatigue. Learn more about Concordia’s Batterman School of Business here and Concordia’s School of Pharmacy here. Research reported in this publication is supported by the National Institute Of General Medical Sciences of the National Institutes of Health under award number R15 GM118304. The content is solely the responsibility of the universities involved and does not necessarily represent the official views of the National Institutes of Health.